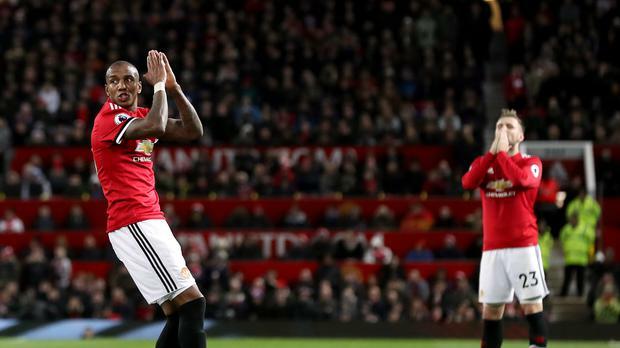 Manchester United endured more festive frustration as an Old Trafford stalemate with Southampton made it three draws in a week. Failure to beat Leicester and Burnley saw them fall well short of the blistering pace set by Premier League leaders Manchester City and a goalless draw with the Saints means they slipped into third behind Chelsea. Both sides had good enough chances to steal all three points the first of which fell to Romelu Lukaku, who was carried off on a stretcher with an oxygen mask in the first half after a clash of heads with Wesley Hoedt. "FT. Boos. United's month started with that wonderful win at Arsenal but they're now resembling the sixth-placed side which dropped points at home every other week last season. They've regressed. #mufc" - A withering verdict from @samuelluckhurst of the Manchester Evening News. It was not exactly a blockbuster performance from the converted right-back but he was thoroughly accomplished in everything he did and if the rest of his colleagues in red had showed similar application they would probably have banked all three points. Young is increasingly sound in his defensive duties, offers a mean cross and even went close with a free-kick. At this rate he might even claim a spot for England at the World Cup. Southampton goalkeeper Alex McCarthy was handed a first Premier League start by Southampton 17 months after signing for the club. He has been involved in an England squad (September 2016) more recently than his last top-flight appearance (for Crystal Palace in March 2016). Received wisdom has it that Saints boss Mauricio Pellegrino is fighting for his future as Southampton boss, but the Argentinian was a picture of calm for most of the evening, He patrolled the edge of his technical area for most of the 90 minutes but was largely an emotionally restrained observer. If only the same could be said of Jose Mourinho. In the second half he launched into a histrionic tirade at fourth official Bobby Madley, though the source of the perceived slight was not apparent. In the first half he stomped to the dugout and back out again within a matter of moments and at no point did he appear to enjoy what he saw.